So we have a lizard in our room. He comes and goes and it is starting to freak me out. I keep waiting for it to jump out of my suitcase or my toiletry bag. In spite of this, we all managed to sleep well last night. After breakfast, the lizard made a return appearance on the wall next to my bed. The bugs that are all around don’t bother me. They are typical for a tropical environment, but lizards in my room? That is NOT something I like. 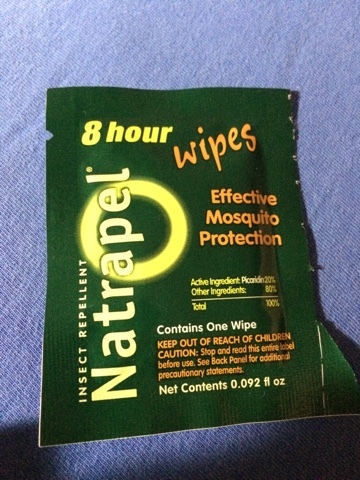 I do have to give a shout out for a product called Natrapel. I did a lot of reading about mosquito repellents and Zika before making this trip. This company uses Picaridin and not DEET in their product and they offer wipes (easier to get through airport security than aerosol). 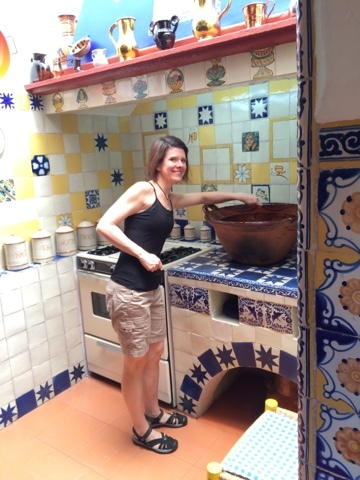 I have wiped myself from head to toe each night in Cuernavaca and haven’t had one bite yet. I purchased a bunch for my Costa Rica trip and plan to use them daily. Bug bites are no fun! After breakfast, we walked to the school where I studied last summer to drop off a care package from the States. 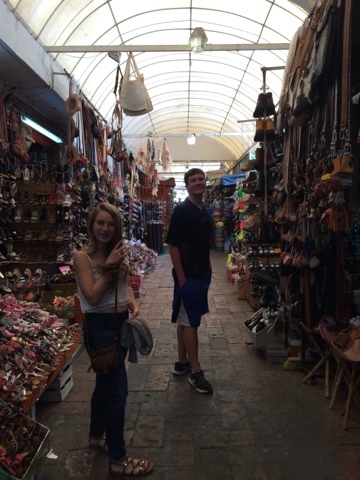 Then, we hailed a taxi to the Cuernavaca market. Unfortunately, I didn’t take many pictures there. I was more concerned with keeping the kids close to me and with not getting lost. It’s huge, dark, crowded and dirty. Kevin was appalled by the meat areas. We saw dead chickens being dropped on the floor, every part imaginable of cows and pigs. 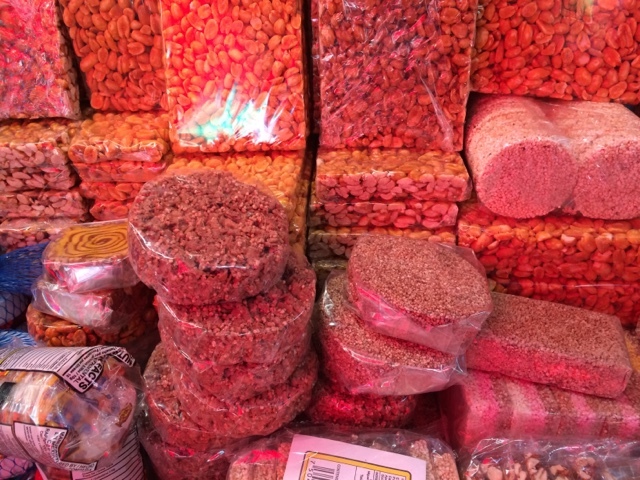 It was eye-opening (and nose-plugging) for both kids to see that much of the world gets food from local markets like these. We just don’t have anything like it in the US. While Findlay Market in Cincinnati is fun, it doesn’t even come close to the conditions that we saw at the market today. 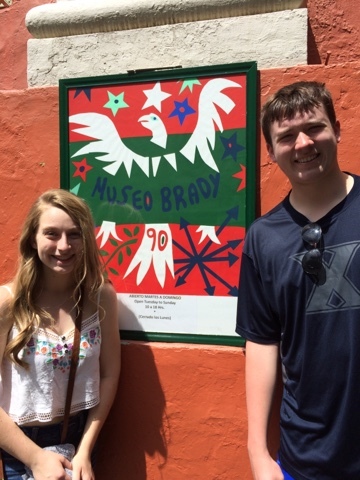 After the market, we took another taxi to the Robert Brady Museum. 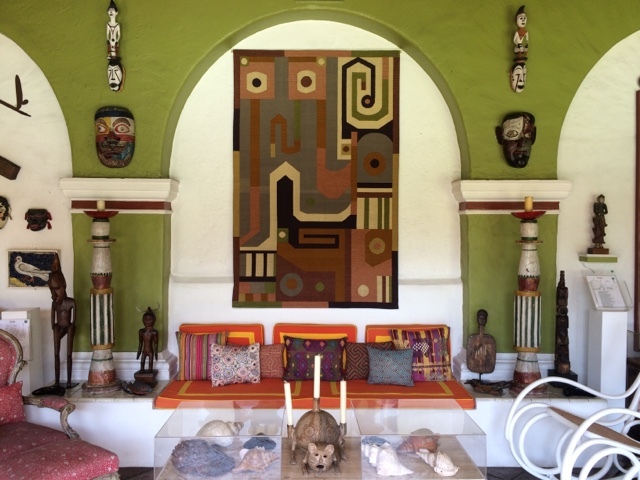 Robert Brady was an eccentric American art collector who lived in Cuernavaca from 1960 until his death in 1986. His home was kept in the exact condition as it was in when he died and is now a museum with art from around Mexico and the world. It is an ecclectic, mismatched, yet amazingly beautiful home that we all enjoyed visiting. 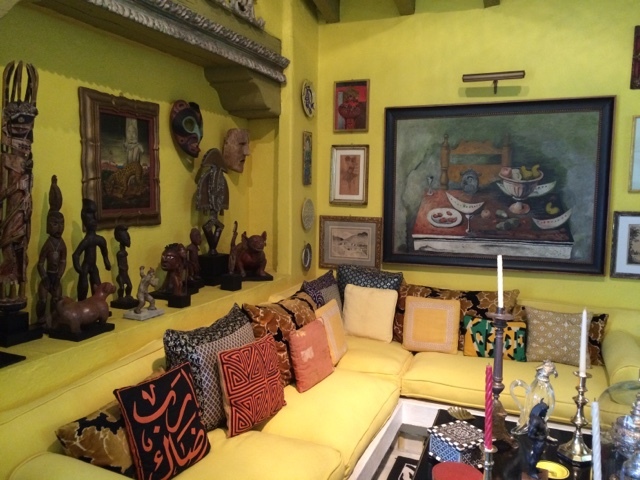 Many of you know that I just painted our den a bright yellow color. When you look at the images of this home, you will see what I was going for in re-designing my own home. I love the look of handmade arts and crafts mixed with masks and traditional art. 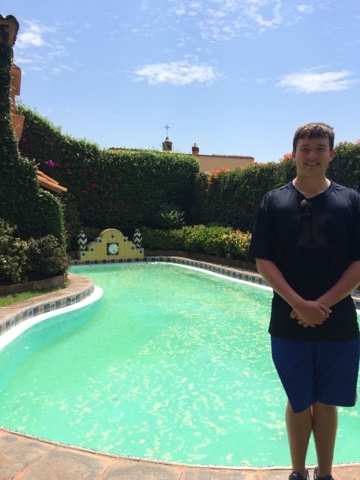 The pool in the courtyard looked very refreshing! 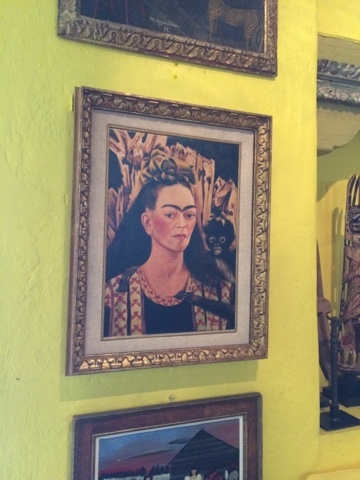 Frida’s famous Autoretrato is on display in the Sala Amarilla (yellow room) at the museum. My dream kitchen. Well, I guess I would prefer a more modern set of appliances, but the tiles are awesome! The yellow room. Love the mix of things in this room. The pea soup green walls in here mixed with the off-white arch insets and symmetry are visually stunning in this sitting room. The gardens at the museum were beautiful as well. The museum backs up to the Cuernavaca Cathedral so one can see the church dome from every part of the courtyard. It’s a lovely place. And I rarely use the word lovely! After our tour of the museum, we went to the cafe at the Cathedral to sit outside and have a drink. The kids had smoothies and I had a water. I decided that I wanted to go to the noon mass while the kids decided that they wanted to wander around. We agreed to meet an hour later. By this time, it was 1pm and the temperature was about 90 degrees. We walked home (2 miles) and took a quick swim before our main meal at 3pm. Marilu outdid herself today. 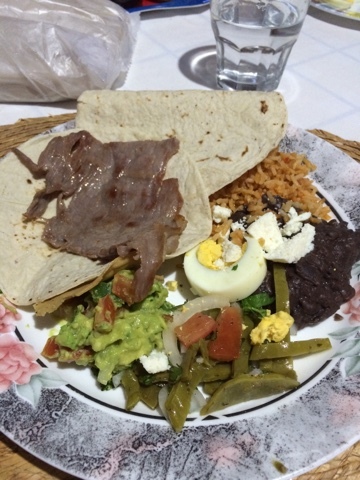 We had carne asada (thin beef slices) with black beans, Mexican rice, fresh corn tortillas, hard-boiled eggs, nopal salad and homemade guacamole. I thought it was delicious! 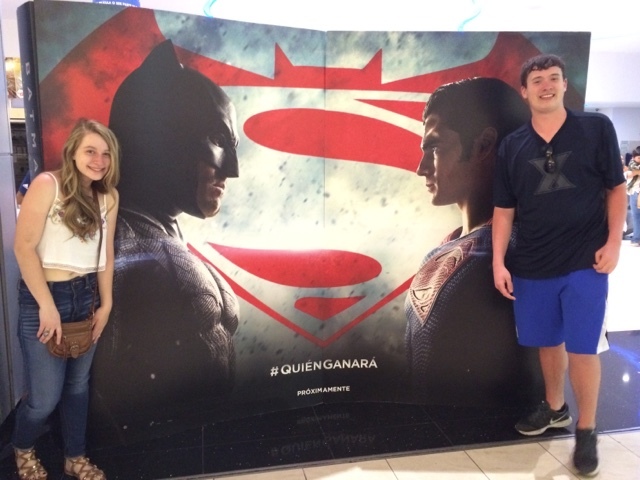 The kids seemed to like it too! After dinner, we rested again for a bit. When there is no A/C, it’s hard to want to do much in the middle of the afternoon other than sit or swim. 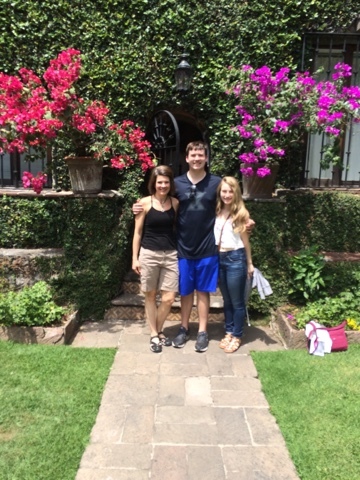 After our siesta, Marilu drove us to Las Galerias, the Cuernavaca mall. 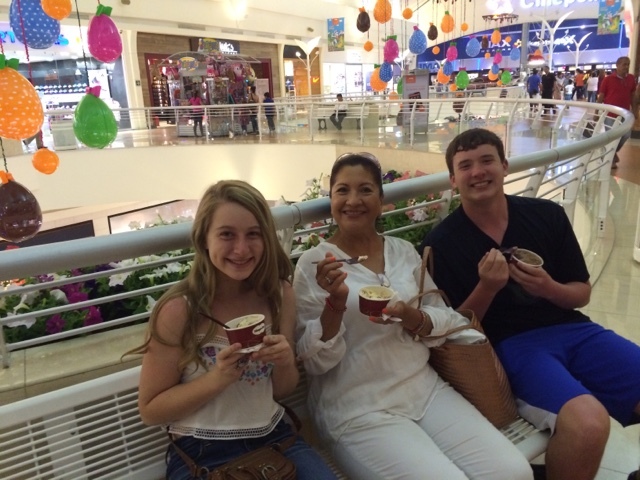 We strolled the mall for an hour or so and then had ice cream at “Haagans” as Marilu called it. Today was 3 scoops for the price of 2. 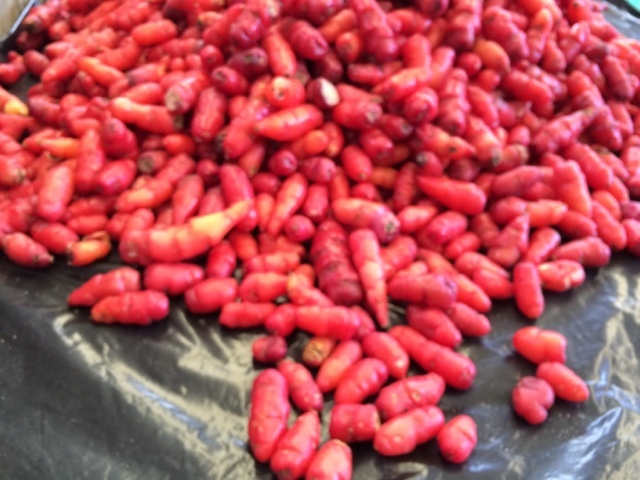 We couldn’t resist having a sweet treat. Since we only eat two meals a day here, dessert makes a lot of sense. 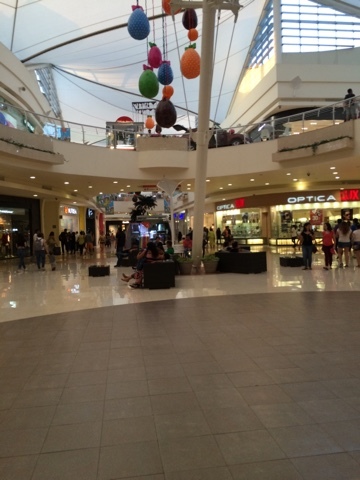 A mall is a mall is a mall. 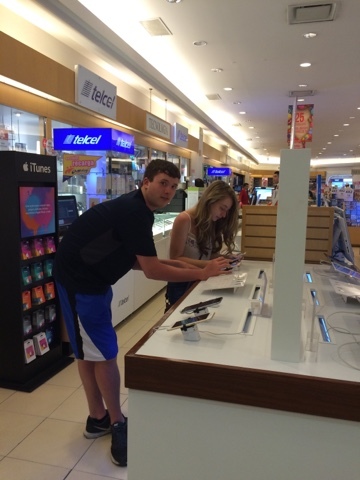 The kids playing with iPhones at the mall. Hanging out with Marilu while watching people at the mall. 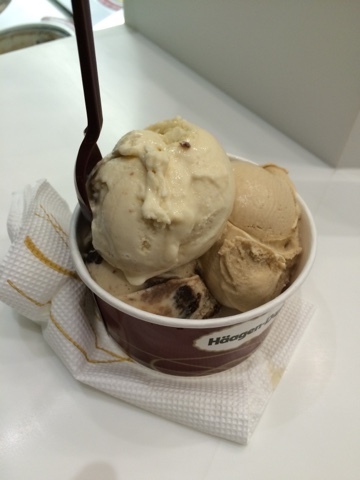 For me, it was rum raisin, Baileys and banana chocolate brownie. Yum!